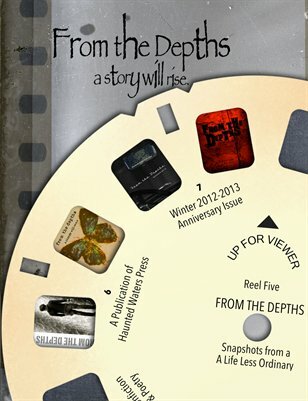 The Winter 2012-2013 Anniversary issue of From the Depths features works of fiction and poetry from M.B. Baken, Robert Earle, Danny LaLonde, Heather Kwolek, Kate LaDew, Jason Stocks and more; creative nonfiction from Adela Fine; and the third installment of Penny Fiction featuring stories of 50 words or less from Rebekah Postupak, Ronald Morris, Meredith Foster and more. From the Depths is a publication of Haunted Waters Press released in the months of March, June, September, and December.